The Auckland to Wellington train service is a scenic rail journey through the heartland of New Zealand's beautiful North Island travelling between Auckland - New Zealand’s largest city and home of the Sky Tower to Wellington - New Zealand’s arts and culture capital. Your journey will take you through rugged native bush, up the world famous Raurimu Spiral, to the beautiful alpine desert region of the volcanic plateau with its majestic volcanoes, down through stunning river gorges to rocky seacapes of the lower North Island, all seen from the comfort of your carriage through panoramic windows on the Northern Explorer train. The train has a Cafẻ Carriage offering a range of drinks, snacks and light meals and open air viewing carriage. 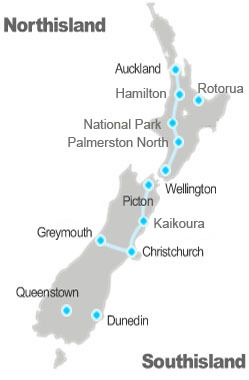 There are connecting bus and coach services from Hamilton to Tauranga and Rotorua and from Wellington and Auckland to other North Island destinations. The Christchurch to Picton train service on the Coastal Pacific train is a scenic rail journey travelling from Christchurch to Kaikoura, Blenheim and Picton - the gateway to the beautiful Marlborough Sounds. Your journey is a scenic feast, with the Kaikoura mountain ranges on one side of your train and the rugged Pacific Ocean coastline on the other. Travel through some of New Zealand’s finest farmland and wine growing regions plus see marine birds, seals and penguins from the comfort of your carriage through panoramic windows. This train has an open air viewing carriage and a Cafẻ Carriage offering a range drinks, snacks and light meals. There are connecting bus and coach services from Blenheim to Nelson and Motueka for the Abel Tasman National Park. 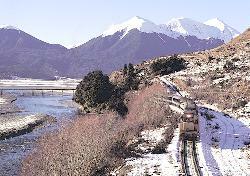 The Christchurch to Greymouth train service on the Tranz Alpine train is a scenic rail journey, travelling between Christchurch, Arthurs Pass and Greymouth - from one coast of New Zealand's South Island to the other. From the comfort of your carriage you’ll see farmlands of the Canterbury Plains, ascending up through spectacular gorges and river valleys of the Waimakariri River to one of three mountain passes through the Southern Alps before descending through the Otira Tunnel to lush beech alpine rain forests to Greymouth - the gateway to the South Island's West Coast and glaciers. This train has an open air viewing carriage and a Cafẻ Carriage offering a range drinks, snacks and light meals. There are connecting bus and coach services from Greymouth to Fox Glacier, Franz Josef, Hokitika, Westport & Nelson.